As your test date nears, it is critical that you develop a game plan in preparation for the day of the exam. If your LSAT is scheduled to be administered in the early morning, it’s a good idea to get in a routine of waking up at the same time as you would on test day, and eating a nutritious breakfast each morning (see our discussion of Brain Food for more information about diet). Because relaxation is critical for a solid test performance, at some point before the day of the test you should assemble the required items you will take with you to the test center. To assist you we have compiled a list of items that you should bring, and some helpful advice to make your LSAT experience go as smoothly as possible. Make sure you have received your LSAT admission ticket from LSAC. Double-check the information on the admission ticket for accuracy. Since backpacks are not allowed in the testing center, put together a plastic Zip-Lock bag with everything you plan to bring (see the list below). On the day before the LSAT we recommend that you study very little, if at all. Typically the best approach for most students is to simply relax as much as possible. Read a book, go see a movie, or play a round of golf. If you feel you must study, we recommend that you only briefly review each of the concepts covered in the course. If you are not familiar with your test center, drive by the test center and examine the testing room and parking situation. This will alleviate any anxiety or confusion on the day of the test. Eat only bland or neutral foods (such as lightly sauced pasta) the night before the test and try to get the best sleep possible (at least 8 hours is ideal). Do not drink alcohol. Try not to worry about the next day’s test! 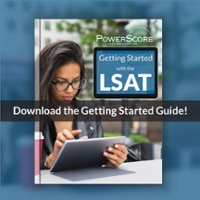 You’ve learned the techniques, and you’re ready to attack the LSAT! Follow your normal routine when you wake up. For example, if you do not regularly drink coffee, do not start on the morning of the LSAT. Constancy in your routine will allow you to focus on your primary objective: performing well on the test. Do a few Logical Reasoning questions if time allows. This will essentially provide an opportunity for you to “warm up” before beginning the exam. Three or four questions should be enough to get you mentally prepared for the test taking experience. Eat breakfast (see our discussion of Brain Food for more information on what to eat). Dress in layers, so you will be warm if the test center is cold, but also be able to shed clothes if the test center is hot. Note: effective June 2007 no hats or hoods are allowed (except items of religious apparel). Leave early for the testing center—even if you arrive an hour ahead of time, you can sit in your car and read or relax. It’s better than getting caught in traffic and having to rush to arrive on time! We strongly believe that performing well on the LSAT requires you to believe that you can perform well. As you prepare to leave for the test center, run through the test in your head, visualizing an exceptional performance. Imagine how you will react to each logic game, reading passage, and logical reasoning question. Many athletes use this same technique to achieve optimal performance in sporting events. According to LSAC, “Test takers may bring into the room only a clear plastic ziplock bag, maximum size one gallon (3.79 liter), which must be stored under the chair and may be accessed only during the break. The ziplock bag may contain only the following items: LSAT Admission Ticket stub; valid ID; wallet; keys; hygiene products; #2 or HB pencils, highlighter, erasers, pencil sharpener; tissues; beverage in plastic container or juice box (20 oz./591 ml maximum size) and snack for break only. Nothing else will be allowed in the testing room (no purses, bags, phones, silent timers, etc. ; see below for a complete list of prohibited items). A valid photo ID with signature is required in order to gain admission to the test. You may want something to eat or drink during the break between Sections 3 and 4. We recommend that you don’t eat anything with a large amount of sugar because a high sugar snack may cause you to become more sluggish as the sugar wears off. Suggested snacks include: granola bars, fruits/vegetables, crackers, energy bars, and dry cereal. According to the LSAC regulations issued in March 2007, a beverage in a plastic container or juice box (20 oz./591 ml maximum size) and a snack (for break only) are allowed. Note: Some testing centers do not allow you to bring food and drink into the center, although water bottles may be approved. Check with the center in advance to find out what you can bring. If there is a vending machine nearby, remember to bring change. You are allowed to place number two pencils (HB for Canadian centers), highlighter, and erasers on your desk during the exam. Mechanical pencils are not allowed. Your testing center may not have a pencil sharpener, so keep that in mind and bring extra sharpened pencils or a small sharpener. If you are not familiar with the area where the test is being given and did not visit the site prior to the test day, bring detailed directions with you. Also, you should find alternate routes in case there is some unforeseeable delay that occurs on your route. The exam rarely starts on time; therefore, bring something to keep your mind fresh and stimulated while waiting for the exam to begin. Testing centers will not allow you to bring a book, so we recommend bringing a newspaper to read while you wait. Reading something while you wait will help in blocking out the nervous chatter of fellow test takers around you. Keep in mind that the LSAC regulations state that you are not allowed to bring paper of any kind into the testing center, but it’s not that big of a deal if they take away your newspaper. Other items you might want to bring: wallet, keys, hygiene products, tissues, headache medicine. Upon check in, test supervisors will ask you to present your admission ticket, one form of acceptable personal identification, and will take a thumbprint. Supervisors are instructed to deny admission to anyone who does not present a photo ID with signature. The test supervisors will assign each examinee a seat. You are not permitted to choose your own seat. Once you are seated the test supervisors will read you the rules and regulations of the test, and have you write a certifying statement that attests that the person taking the test is the person whose name appears on the answer sheet and that you are taking the test for the sole purpose of admission to law school. Typically, the actual test will not begin until thirty to forty-five minutes after you are seated. The test supervisors keep the official time, but they are not obligated to use a digital timer. They will announce a five-minutes-remaining warning for each test section. You may work only in the assigned section. Testing supervisors may circulate throughout the testing room to ensure that all examinees are working in the appropriate section. Blackening of answer spaces on your answer sheet must be done before time is called for any given section. You will not be permitted time after the test to clean up your answer sheet or transfer answers from your test book to your answer sheet. If you find it necessary to leave the room during the test, you must obtain permission from the supervisor. You will not be permitted to make up any missed time. All test materials, including test books and answer sheets, are the property of LSAC and must be returned to LSAC by test supervisors after every administration. Legal action may be taken against an examinee who removes a test book and/or reproduces it. If you engage in any misconduct or irregularity during the test such as creating a disturbance; giving or receiving help; working on or reading the test during a time not authorized by the supervisor; removing test materials or notes from the testing room; taking part in an act of impersonation or other forms of cheating; or using books, calculators, ear plugs, headsets, rulers, papers of any kind, or other aids—you may be dismissed from the test center and may be subject to other penalties for misconduct or irregularity. The penalties for misconduct are high: you may be precluded from attending law school and becoming a lawyer. If you encounter a problem with the test supervision or test center itself, report it to a test supervisor. Reportable problems include: power outages, mis-timing of test sections, and any unusual disturbances caused by an individual. If you feel anxious or panicked for any reason before or during the test, close your eyes for a few seconds and relax. Think of other situations where you performed with confidence and skill. Test results will be mailed back approximately five weeks after the test. Diet tips for maintaining top mental health. Do you need an especially large vocabulary, or perhaps a working knowledge of legal or logical terms, in order to do well on the LSAT? If the LSAT is just around the corner, you may be taking a look at how your prep is going and thinking that you are simply not ready for the test.